Everyone in my family enjoys to be the center of attention, I’m not denying that for even a moment, but when it comes to using the bathroom it’s something we prefer to do on the down low. This is why we’ve gone and tackled the project on our to-do list that keeps our family from literally bearing it all; our basement bathroom window needs some privacy. You see, in designing our new basement we had made some adjustments to where rooms sat because it worked better with our families needs (see the renovation process here, here, here and here). We built a bigger bathroom, put in a bedroom and media room, a small den, and situated things so that we had more of a designated area for our abundance of laundry. So what used to be a bathroom is now a laundry room, and where the new spacious bathroom lays is a window that was meant for a laundry room, big beautiful and not private what-so-ever. The upside to all this room changing is now when we do our laundry, we have zero fears of our neighbors peering in to steal any top secret folding techniques. 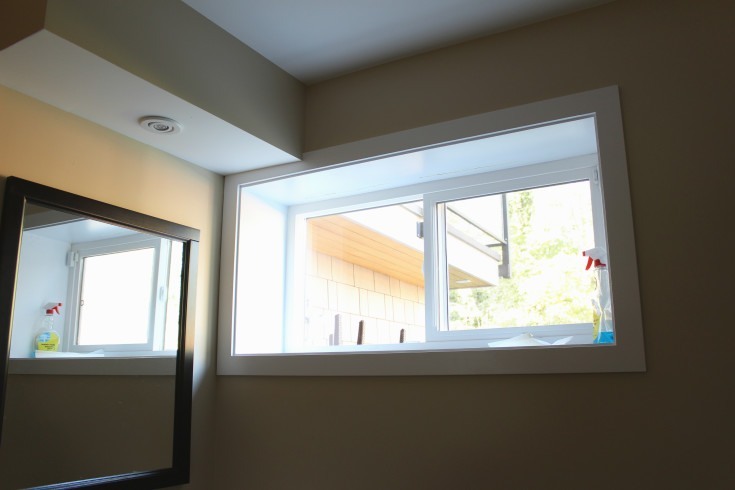 We knew the most affordable way to do this would be an after-market product that would allow us to keep the current window. Replacing the window, or just the glass would cost hundreds and that just wasn’t an option considering we had just replaced them all 5 years ago. 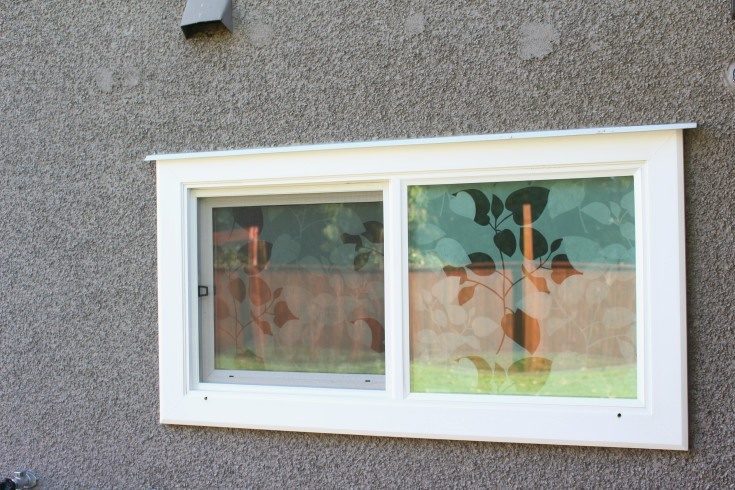 The product we found is a film for the window that sits atop the glass by static cling. 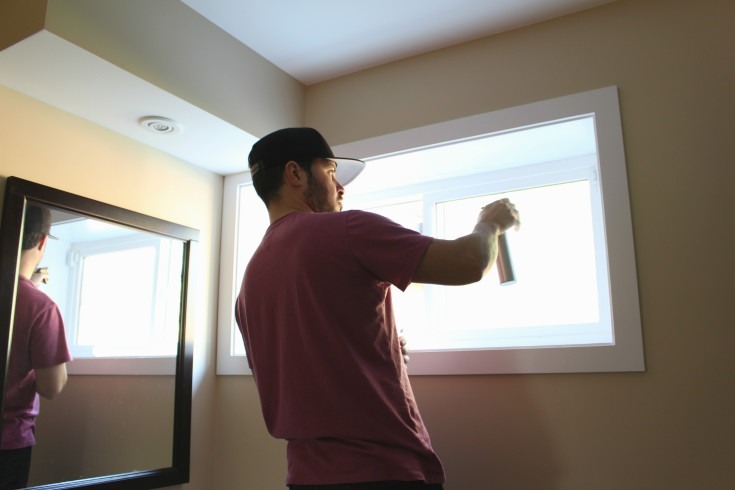 It’s from a company called D-C-Fix and is literally sold everywhere (Amazon, Home Depot, Rona, Sears, Walmart, and Lowes), everywhere that you would consider shopping at when you think about making cosmetic changes to your home. 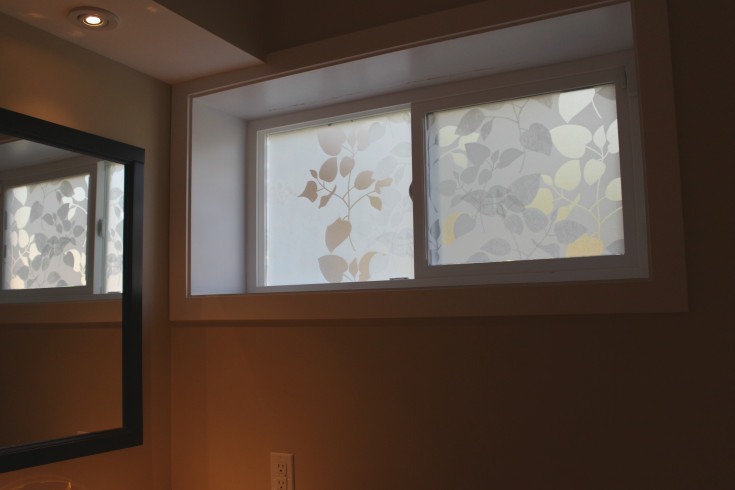 The company makes many different designs for many different reasons; window privacy, to affordable update furniture, for counter tops and even flooring. FUN RIGHT?! Trust you me, I didn’t just get one roll, I plan on venturing into some décor DIY’s with D-C-Fix. The product was so easy to use, it literally took Sammy, Sofia and I about 20 minutes to complete. Considering one of our workers was more interested in seeing how long she could shimmy out the measuring tape before it snapped, that’s pretty good timing I’d say. We measured up our windows and deducted 2mm at each side to fit snugly inside the frame. Once we had both pieces cut, we went on to prep our window by cleaning the glass with an all-purpose cleaner. 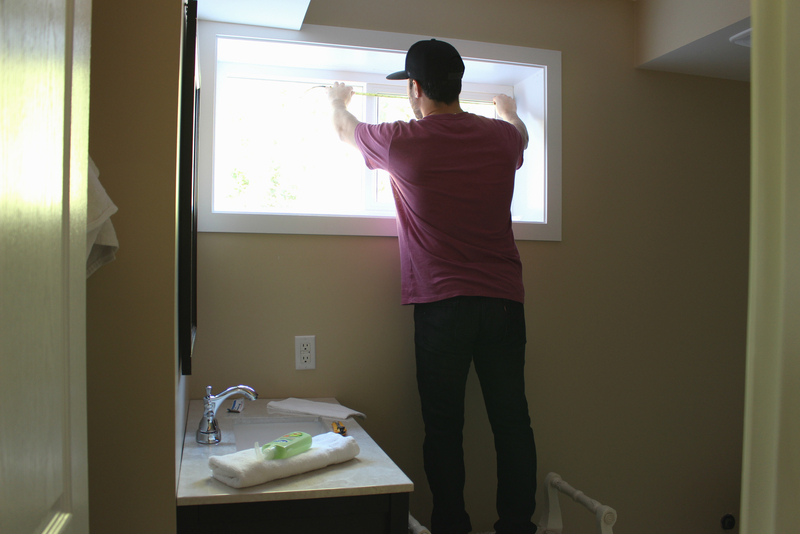 Next we sprayed the window with water making sure to give complete coverage including the corners. 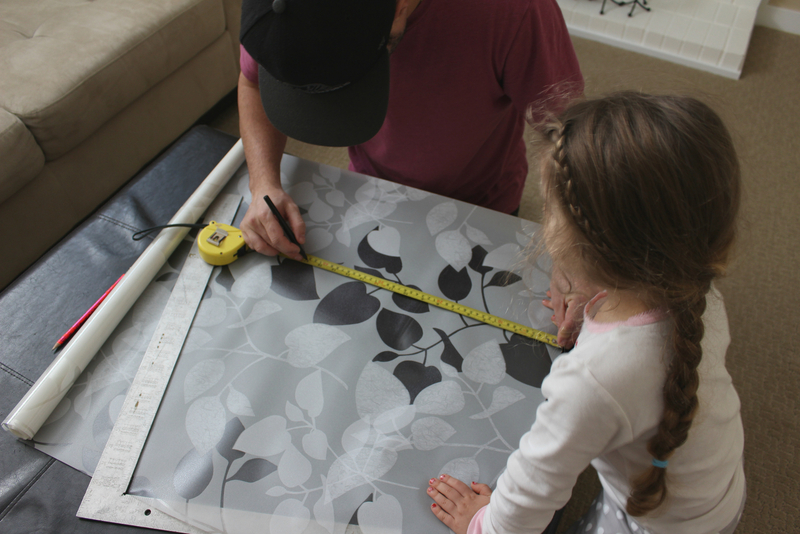 Matching up our cut-out to the top of the window and slowly apply pressure as we went down. At this point we pulled out a rewards card from Sammy’s wallet to help compress the film to the window giving it a secure suction. We then continued to go over the product with our card from top to bottom removing any air bubbles and excess water. Drying up the area with a towel, we moved onto the next window just as we had done the first. It was literally that easy. 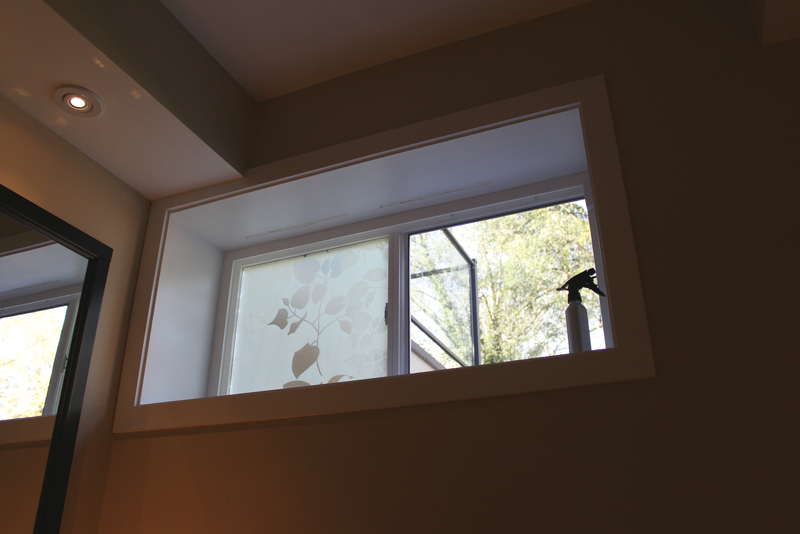 We love how it not only gives us privacy when we want it most (sorry neighbors, shows over), but it’s still able to offers the room so much light. Loving the space even more now that I can use it. Disclosure:: We did receive product to compile our post, however the opinions are completely my own. I Love this idea. now I could open my window blinds with privacy still there. Let in some light too.